From the Home screen 'All' tray, select the Setup icon. If presented, review the End User Agreement then select I Accept. Enter the desired user name into the User name field then select Continue. For additional settings (e.g. Your name, Signature, Login Information, etc.) select Change Settings, edit as necessary then select Save. 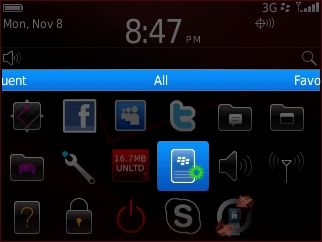 Highlight the BlackBerry email address (ends with @vzw.blackberry.net) then press the Menu button.